In the realm of Beagle-dom, what do I have to be thankful for? I am grateful for my 2 wonderful Beagles, Tinker and Virginia, without whom I would have never known the joy of absolute canine love and loyalty. For their spirit and their sense of fun. I watch them excitedly greet each morning, happily looking forward to the prospect of new adventures in exploration and snoozing.... and mischief. And I chuckle at their morning "Beagle aerobics", the two of them stretching and shaking out in tandem.... as they prepare to spend their days taunting and amusing each other and then contentedly curling up together with a sigh each night. I am grateful for the wonderful people in the rescue community who unselfishly give of themselves and their time for the love of the Beagle breed. To the shelter workers, rescue volunteers, transport drivers, and email cross-posters who beg on behalf of neglected lives...... you are the unsung heroes. Despite the ongoing lack of respect paid to animals in this country and a woefully imperfect shelter system, these people are rewarded by knowing that in some small way they have made a world of difference for some wonderful hounds. I am grateful for our savvy and loyal BOTW readers! Thank you for your feedback, for following the Daily Digital and Tinker's Blog, asking questions of Virginia, and your appreciation of all things Beagle. What are YOU grateful for, Beagle-wise, this Thanksgiving? 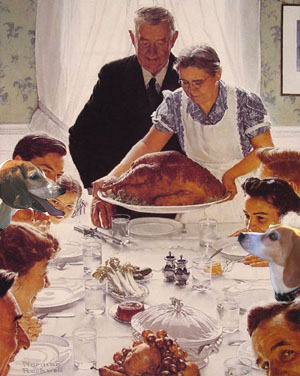 Email me at Caron@beagles-on-the-web.com and I will post the best of the responses on Thanksgiving Day. Everybody hug your Beagles, and have a wonderful holiday! !